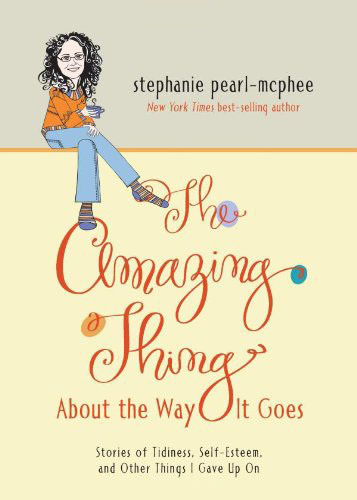 Everything is adorable! The snowflakes are gorgeous despite their size. Almost there! Tiny success will be yours! I am a terrible person: your knitting is gorgeous, your idea is wonderful and I love it, and your snowflake should have six points. It is a Thing of mine. It does not diminish the adorableness or the cuteness or any of the ness, just the accuracy of your knitted water’s molecular geometry. So glad you said it first, ’cause I don’t think there’s enough miles between me and Toronto to protect me from Stephanie’s wrath! But yeah, the 5-pointed snowflake is making me twitch, despite the exquisite knitting. Whaaaat? I like learning new things! Thanks. ‘Knitted water’s molecular geometry’ is sounding very Zen to me! Thank you so very much, on behalf of all of us trying to come up with a tactful way to say ‘snowflake = 6 points’. I know Stephanie said she has (or had) bourbon, to help her cope, but I was afraid to be the one to tell her. I live too close to Toronto. Well in sure you ladies are just wonderful. But that’s ridiculous. LOL. Ianajoh, have you seen the periodic table of sewing elements? The scientific seamstress has it on her blog and I think you would enjoy. I am a fellow geek, in case you could not tell! Really want to see Steph freak out? Challenge her to knit some actual molecules. Oooooo — you think of the best stuff …….. I nearly went off on a rant about 5 vs 6 points but then I realized my rant was about stars (the US flag has 5 pointed ones; the star of David has 6 points). Snowflakes totally have 6 points. But then again, snowflakes are made of frozen water, not cobweb lace, so I guess Stephanie wasn’t actually making a snowflake but rather an Advent calendar ornament meant to bring winter-y thoughts to mind. But yes they are fantastic and tho I am not going down the rabbit hole, maybe when I have grandchildren….I love the wee knitted things as a retirement project…. Your little things are perfect, snowflakes and all. You are a first-rate aunt. And I thought painting thumbnail sized hedgehogs was a degree of crazy only reached by certain people. The next question from a few of us might be can we buy one or two of your 100 bells? LOL Lovely snowflakes and other items! I have often wondered if it would be possible (or sane) to try to knit something tiny on round wooden toothpicks. One could even use them as dp needles! Yes I have, but not in the round. Try it, it was fun. The sewing thread was dark navy blue, I cast on about 12 stitches and did some freestyle lace stitches. I crocheted the cast off to the cast on when it was long enough to fit around my finger. Next time I would sand the toothpicks better and buff with candle wax because they caught on the thread so I had to make very large stitches. It was a pretty Lacy ring and I added a bead to the centre but it got soggy everytime I washed my hands. The snowflake is so gorgeous I would do it again! Put the remaining 99 bells in a box with a very secure lid. Tape the bag shut first, even. There will still be bells in strange and unexpected places for the next 3-5 years. Or more. Though your children are older than mine, so maybe you’ll be safe. Tie ribbons on them and throw a couple in every present. Make it fun for present shakers. I predict that they will end up in the Tape Measure Bermuda Triangle. Okay, I’ll admit it. As I read this post, I thought you had gone off the deep end with the tiny snowflake. There’s only so much perfectionism one can have around the holidays without causing an epic meltdown that radiates out to innocent bystanders. Then I saw the final product. It’s insanely, perfectly beautiful. The repeated five point motif in the center is awe-inspiring. I admit it, you were totally right. It was worth finding the red zone of the stress-o-meter. Now I must go make one too. Where does one buy 0000 needles and cobweb lace?? Which the law of lost objects dictates will only be found /after/ the purchase of new ones.
. .. at least, that’s the way it works for me. Once you never need any more, many will begin appearing! Those are exquisite – I love the light behind the snow flakes. Magic and more magic. Gads…do you use a magnifying glass. I would have to, one of those cool ones with a light that shines underneath. I do have a friend, exquisite strong knitter, who knows many of those words that one strings together … is a perfectionist and owns maaany smalls needles and teeny yarn. I believe I will torture her with these patterns and pix 🙂 Thank you so much. I have one of those lights. They are awesome! 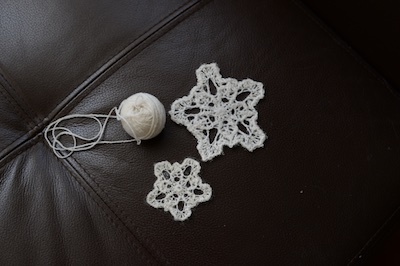 I was about to suggest tatting a snowflake instead (not sure how much it matters that all the wee bits are knitted). 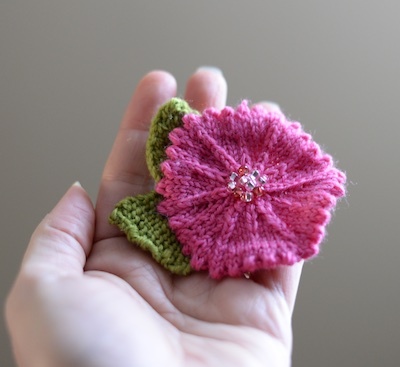 Your wee items are gorgeous, and I keep thinking I should join in and knit some for my granddaughter – and then I snap back to reality. 🙂 Maybe some day…. My first thought was that crocheting a snowflake would be ever so much easier! I totally love your blog! What really made me laugh is that I’m going through all the same moves while I’m trying to figure out how to make even ONE sock (!). I have the 6 snowflakes my mom made in the 1970s. she called it “tatting”, old style lace making. Same size as yours. Heirlooms! 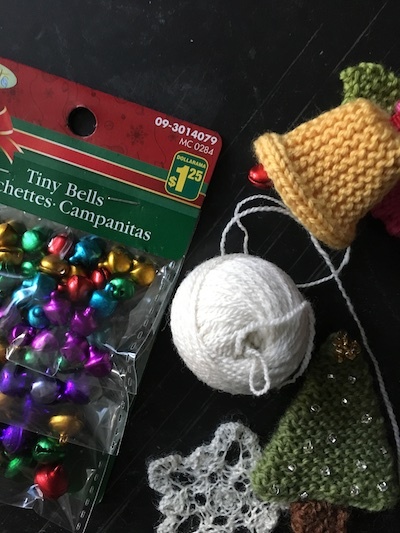 Little ornaments with little bells tied to every Christmas present. Don’t we all want a tree with hand made ornaments? Or little bells for everyone, just a sweet present all by themselves. Woe be to the child who loses (or eats) that snowflake! The snowflakes are both impressive. Do you not like the eyes written into the bluebird pattern? With leaving the short row wraps? 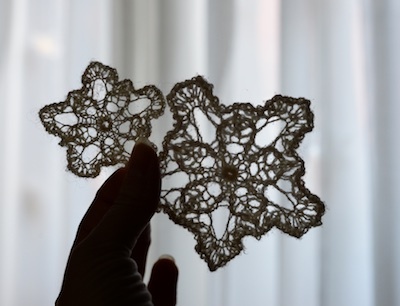 I love thread snowflakes — knitted, crocheted, whatever. I have dozens of them, and they hang on the tree, in the windows, from the light fixtures — dozens of them. After going berserk trying to make the first one, I ordered the rest of them off eBay. Way to go! Exactly what I would do. Sensible! I am barely ready for Thanksgiving (forgot about it altogether) and now I have to catch up and think about Christmas? Really? I am so out of it this year. Not in the least bit ready…just like I ain’t ready for snow and it’s been flaking here for two days. No accumulation but…it left it’s reminder of it’s presence all over the trees. The year is effectively over and 2017 is staring me in the face. AAAAhhhhh!!!! I bought those same bells today, for a pair of Santa Mice! But they’re too big, so the recipient will have to be satisfied with pom-poms. Gorgeous little things (even if they do smell like bourbon). As for all those bells….well, Millie is set for cat toys for the rest of her nine lives! Did something happen on the plane when your returned from your last trip? Were there strange fumes in the cabin? I think you’ve gone mad as a hatter, my dear. 0000 DPNs were once torture devices, long ago banned in the UK. The first snowflake wasn’t enough,so you had to knit another? And then it turns out to be a five pointed star and not a snowflake at all? Good heavens. Next time just grab the bourbon and go to bed. Well….this is a totally normal spectator sport at this time of year: see previous years’ posts!! Those snowflakes are beautiful, I have a couple we hang on the tree every year but they’re a smidge bigger. I find myself wondering if cobweb is very fragile though. Can a more experienced knitter chime in? As @Barbara from further on in the thread noted, teeny tiny fine lace is one of the (very few! and I say that as a dedicated crocheter/novice knitter) things that crochet intrinsically does better than knitting. Yes, knitted cobweb-weight wool lace does tend to be soft, saggy and fragile (not to mention potentially vulnerable to moths while packed away in the ornaments box in the attic for 11 months of the year). Crocheted fine-thread cotton lace tends to be crisper, much sturdier, better at shape-holding, and more moth-resistant. 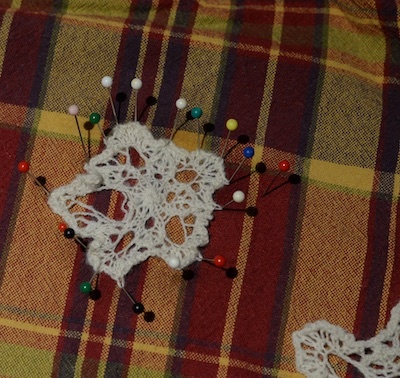 You can make incredibly fine eensy little lace things with 80- or 100-weight cotton thread and a tiny steel hook. 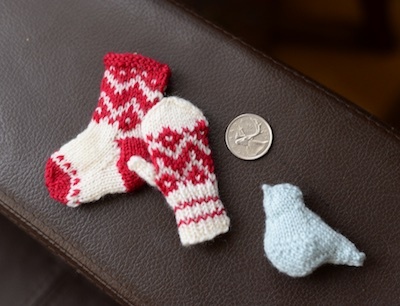 But then, of course, they wouldn’t be *knitted* tiny things, so there’s that. 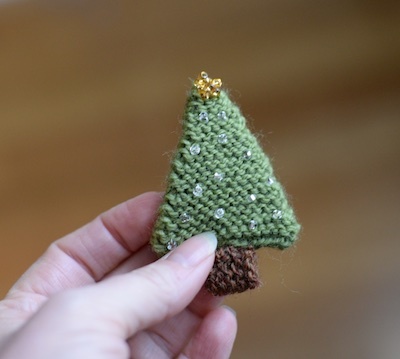 I should make knitted ornaments for my lil’ tree. These are so cute. I once managed to buy a mere 20 bells. Predictably, I still have most of them. Five went on a jester hat some years ago, four on a wrist rattle I knit for a friend’s brand-new baby last week (pattern by Wendy Poush on Ravelry), and one turned out not to have the operative bit in the middle. It’s still around here, somewhere. Because I’m bound to find a need for a mute bell before I die, right? I don’t think so, but it’s less crazy than drinking bourban and knitting snowflakes. One of the beautiful things about snowflakes is that they’re all different just like people. My eyes hurt just thinking about trying to knit with cobweb-weight yarn and those tiny needles! You are a committed knitter, I will say that. Stephanie, the snowflake would have been the perfect time to pull out a hook and crochet it. I’m a knitter but there are times when crochet does the job better. At any rate, your wee things are lovely. And Advent calendars bring joy year after year after year. Your niece will treasure it. You are a light in a world of travail. Glad you are back. What a beautiful collection of “Littlies”. They are all adorable. The snowflakes are out of this world. Could you use a spray stiffener on the largest one and use it as a tree or window decoration? They are all beautiful. These are so adorable, but every time you post them I’m grateful that I can crochet if I ever want to make tiny things. I know how hard small circumference knitting is. Lovely snowflake. 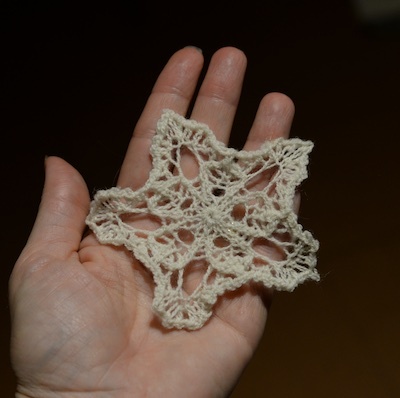 A couple of people have mentioned this already — crochet has it’s uses and snowflakes are one of them. I’m a knitter but I’ve recently learned how to crochet. And it makes flat lacy things way better, faster and easier than knitting. It’s well worth a look-see. The crochet classes fill up at the Purple Purl. And it’s good for the subway because you secure it with just one tiny stitch marker each time. How about a little scarf….with fringe? I love your little things. Great advent things and so clever and imaginative. Sorry it’s driving you crazy. But you will heal! You buried the lede, or at least the punchline. You then went back and fixed the next bigger one? Nah, I just starched the first one that was too big. The second one was a lost cause. better you than me. I might not recover and end up in some kind of knitting rehab. Gawd!!!!! I adore the tiny things. Thanks for the inspiration. I don’t think I will mange them before the time is right But I think I can for next year. What a great idea. Thank you for sharing. 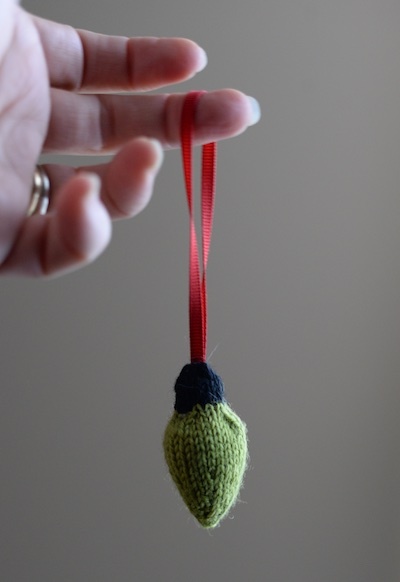 That being said, it just occurred to me I made myself a mini sweater mini mini ornament last year that was quick and easy and I didn’t need alcohol either, although I probably had some. Did it ever cross your mind at some point to deliberately shrink something to size???? Maybe fewer words involved. I know the one with the dropped stitch was a lost cause, but just wondering. I think it would have been too fuzzy – felted lace would be pretty dense, and you’d miss all the holes and stitch definition… what makes these so pretty is how open they are… right? It’s perfect, the snowflake. And now you have two other snowflakes to add to your tree or your windows. Starch will hold them in shape. Carry On. They are all lovely. The wee-est are magical. And I thoroughly get having hard liquor nearby-I named one of my projects the Scotch Shawl-swore it would drive me to drink. Hope I’m not asking a dumb question…what kind of starch did you use? A special product or just the regular stuff…Glide I think it’s called? When did you apply the starch? My thoughts would be to block it and then immediately spray the snot out of it while it’s still wet. A friend diluted white glue and soaked the project before blocking…she covered her mat in parchment. Oh sorry…the dumb question turned into three! I realize you’re probably being a knitting purist about this calendar, but snowflakes are one of the few things I will crochet rather than knit, especially since you start in the middle and can stop when they’re big enough! Such a lovely collection of tiny things. I might give up on the snowflake though. They have six points not five. Well, after a rough morning start to Turkey Day, I treated myself to your blog. Perfect remedy! Happy Thanksgiving from the USA and Happy Knitting! Well, yes, about the five-pointed-snowflake, but Stephanie has seen and made enough of them to actually know that, huh? It’s artistic license. It’s beautiful, and holy crap 1.25 needles and cobweb lace! Well done!! So beautiful, and you’ll be done by the end of the month!! My first thought was also “snowflakes have 6 points” followed by ” a crochet snowflake would have been done and dusted in less than 5 minutes – no need for tears, cursing or bourbon” then I remembered Steph’s aversion to crochet and figured it may have got done quicker, but would still have involved tears, cursing and bourbon . . . . .
Everything is beautiful and so so sweet! I won’t be trying these things this year… but maybe someday. It’s definitely prettier in the tinier size. Well worth the effort. They are all adorable, but my favorite is the tree. I love ALL the bitty things. All of them. I’m not sure which one is my favorite. Currently, however, I’m knitting big things. I don’t have the time or patience at the moment for tiny; big is so much easier. I never thought about the difference in ease until I read your blog posts about the bitty things. I have been making tiny stockings with leftover sock yarn for days now. My husband calls it my “Tiny Sock Nation”. There is something satisfying in knitting tiny things! You have outdone me a thousand fold. I love seeing your tiny knitting! 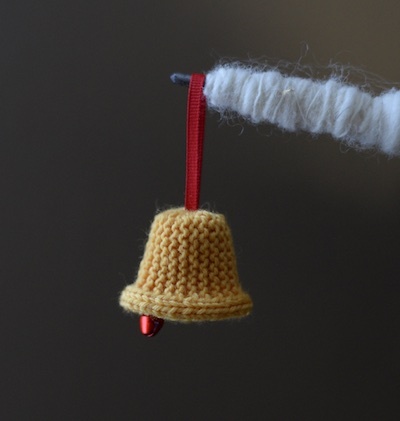 My friend is a ‘tiny’ knitter. She uses piano wire (surely Joe has something vaguely equivalent) and silk thread. Only suggesting … if you want complete insanity. I so want to make these–they’re wonderful! That little mouse with the wings and a skirt may be the cutest thing I will see all year.. OMG.. I need to try tiny knitting. I don’t know if this will make you feel better or worse, but I watched this today. It’s an old video profile of the lady who knit for the movie Coraline. The bell brought back a flood of elementary school memories! My Mom was somehow suckered into being the PTA president every year (3 different schools) and for the Christmas bazaar every year she’d knit dozens upon dozens of the Christmas bells with a few mini-mittens and Santa hats trimmed with fluffy yarn. Wonderful! Will we get to see all the tiny things together? …and here I thought knitting socks on size 1 needles was a total pain in the a$$. This takes OCD to a whole new level. Loved this post. Mazel Tov on finally figuring out the snow flake.